Ages 4 through 18-11. 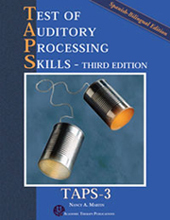 The TAPS-3 - Spanish Edition measures what a person does with what is heard, and is intended to be used along with other tests as part of a battery. It is designed to be used by speech-language pathologists, audiologists, school psychologists, and other testing professionals. The new Spanish version of the Test of Auditory Processing Skills 3rd Edition (TAPS-3, 2005), is NOT just a translation. The TAPS-3:SBE includes new items equivalent to the English version that were reviewed by Spanish-bilingual testing professionals. The TAPS-3:SBE provides separate norms that are based on 800 Spanish-speaking children in the U.S. ages 5-0 through 18-11. The structure of the test is similar to the English version but allowances were made for language and grammar differences. Notably, the subtest in the English version that utilized compound words was dropped because such words are extremely rare in Spanish, and new sentences with idioms were developed. Although the test is administered in Spanish and the responses are expected to be in Spanish, the examiner may use English to give directions, if necessary, and English responses may be accepted if the meaning is the same as the intended response. Subtest scoring is the same as in the TAPS-3, allowing partial credit in order to reflect more accurately the child's processing ability. Individual subtests are reported as scaled scores, while cluster scores (Phonological Skills, Memory, and Cohesion) and the overall score are reported standard scores; percentile ranks and age equivalents are also provided. The complete kit includes the test manual and record forms.